Rock Hill Capital Group provides majority recapitalization funding for Tideland Signal Corporation. How GulfStar helped a family improve the future value of their father’s prestigious company. There are all kinds of reasons why an owner might want to sell his business. A wife and her three sons living in four different states inherited Tideland Signal Corporation from their husband and father, who had founded the business in 1954. Suddenly, one of the founder’s sons, a physics professor in Ohio, found himself the chairman of a leading provider of marine aids-to-navigation systems, overseeing a firm with four operating divisions and a staff of over 130 people worldwide. The business was being operated by a management team that had worked for the founder. The family was not actively involved and, understandably, when they received an unsolicited offer from a US strategic buyer, they were tempted to take it. Before they accepted the offer, they asked GulfStar for advice. Managing Director Kent Kahle took a look at the offer and suggested that they might do better by talking to more buyers. After talking to a number of potential buyers, they received a letter of intent from a different strategic buyer for a substantial amount above the initial offer. At the same time, the original bidders upped their offer and improved their terms to be more competitive. Because the terms of the new offer were still better, GulfStar began the due diligence process with the different buyer. Unfortunately, two months into it, things took an unusual turn. The new potential buyer changed its mind and backed out of the deal, and then the original bidder decided the timing wasn’t right for it either. This is not the way anyone likes a deal to go, nor is it typical. Nevertheless, it happens. GulfStar’s experience made a valuable difference in this case. The team conducted a new, very targeted auction, leveraging strong relationships in the private equity market. The resulting deal with Rock Hill Capital Group was a majority recapitalization that has allowed the company to continue to grow. It also provides a second opportunity for the family to prosper when their even more valuable company is resold in the future. Through its merchant banking affiliate, GulfStar made an equity investment in Tideland, and Kent Kahle currently sits on the Board of Directors. 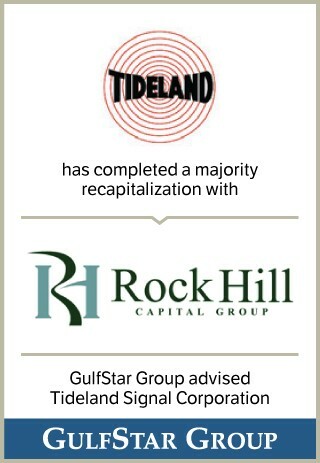 Since the initial majority recapitalization, Rock Hill Capital Group worked with Tideland to gain greater economies of scale and operate more efficiently. Together, they performed international restructuring, strengthened the management team and made a strategic acquisition in The Netherlands. 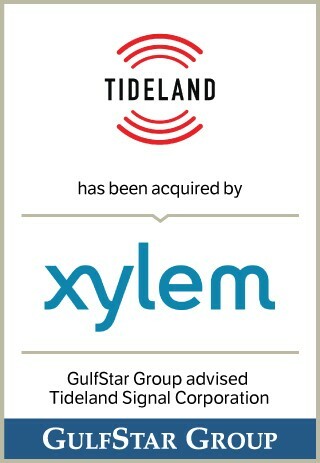 Four years later, Tideland received an unsolicited and very attractive offer from Xylem Inc. (NYSE), a leading global water technology provider that saw Tideland’s marine and offshore capabilities as its ideal complement. For a family serving as passive investors in a business they inherited, this opportunity to enjoy a “second bite of the apple” was especially rewarding. Tideland retained Gulfstar Group’s Kent Kahle and Associate Aaron Pyle to advise them through the second sales process. My family is extremely pleased with both the initial transaction and the additional liquidity received from our rolled equity. This final chapter allows us to move on comfortably, knowing that the company has the opportunity to continue its fundamental mission of providing the maritime world with first-in-class aids to navigation.